Crown Fraction Burned (CFB) is a theoretical concept that is used to model and classify crown fire. It may be observable after the fact in burn severity assessments. 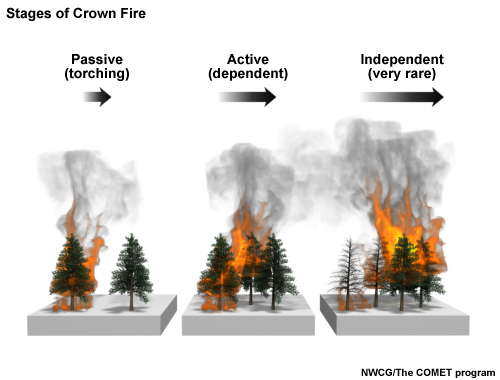 Passive Crown Fire (Intermittent or Persistent Torching) occurs where surface fire intensity is sufficient to ignite tree crowns, individually or in groups, but winds are not sufficient to support propagation from tree to tree. CFB between 0.10 and 0.90. Active Crown Fire occurs where surface and crown fire energy are linked. Surface intensity is sufficient to ignite tree crowns, and fire spread and intensity in the tree crowns encourages surface fire spread and intensity. CFB at least 0.90. 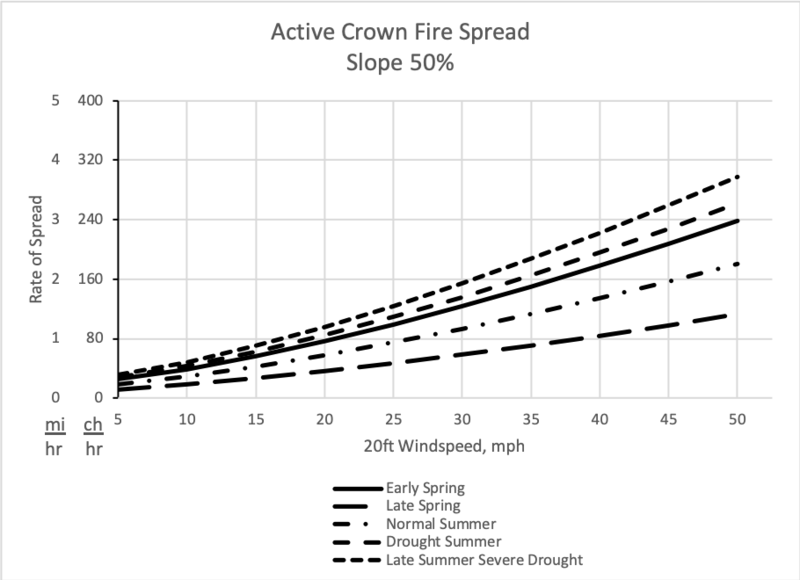 Independent Crown Fire occurs (rarely) where tree crown loading and flammability is sufficient to carry fire without surface fire contribution under ambient weather and wind conditions. CFB generally approaching 1.0. Isolated Tree Torching should not be considered crown fire, though it may be an indicator of potential later in the burn period. It usually occurs due to anomalies in surface fire behavior due to jackpots of surface fuel, isolated terrain features, or brief wind gusts. CFB is less than 0.10. 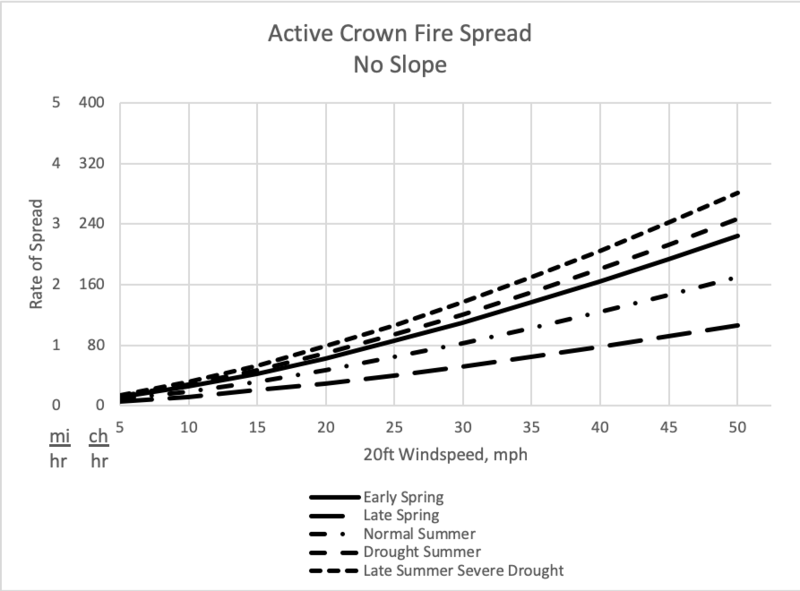 These graphs, using season, slope, and 20ft windspeed, provide rough estimates of active crown fire spread rates using the Rothermel Crown Fire Spread model. FM4 (Chaparral) for New Jersey Pine Barrens and Lake States Jack Pine. FM6 (Dormant Brush) for Alaska Spruce Taiga. FM7 (Southern Rough) for Alaska Black Spruce/Shrub Communities. 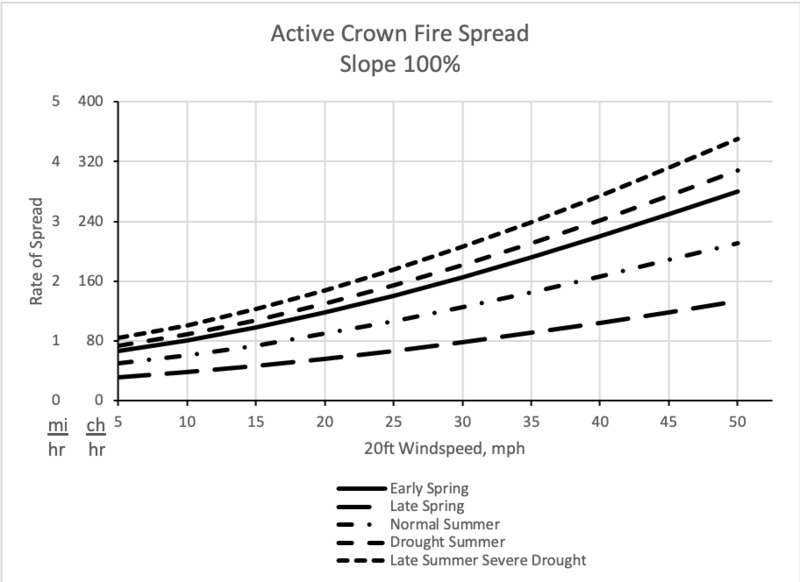 Bishop (2010), in developing the Fireline Assessment Method (FLAME), averaged spread rates for fuel models 5, 6, and 7 to estimate crown fire spread. Fuel Models sh5 (145) and sh7 (147) have been used in the same manner in spatial modeling in different situations. 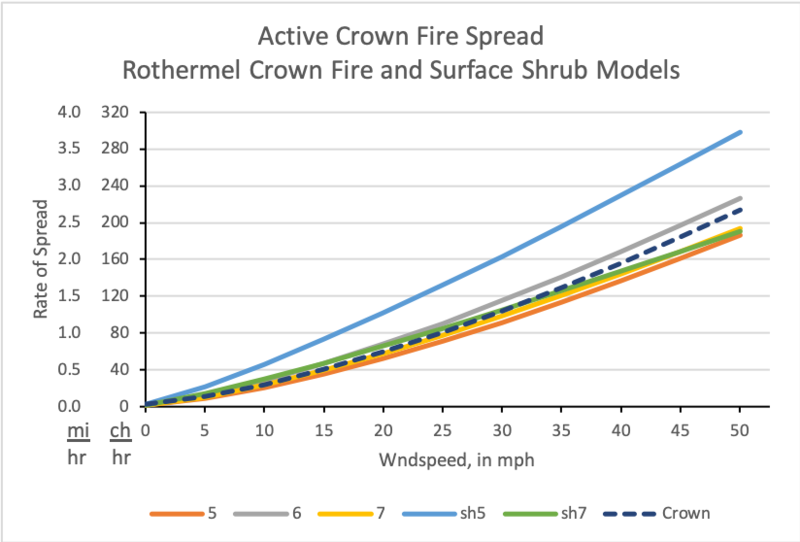 This graphic demonstrates the similarity in spread rates produced by the Rothermel Crown Fire Spread Rate (crown) and several surface shrub fuel models. Caution: Using surface fuel models to represent crown fire behavior may not accurately provide for the calculation of Crown Fraction Burned (CFB) or the modeling of increasing spread due to passive crown fire (torching and spotting) behavior in spatial fire analyses. It may also over-estimate fire spread and intensity under moderated environmental conditions.